Orka Diamond Villas with a shared swimming pool are a spacious, modern property in Ovacik for sale with 3 en-suite bedrooms. The Orka Diamond Villas share a large swimming pool with a separate childrens area and everyone has their own small private garden and BBQ are. There is ample room around the large swimming pool for sunbathing. The villas have an open plan living design downstairs with the lounge, kitchen and dining area set out. 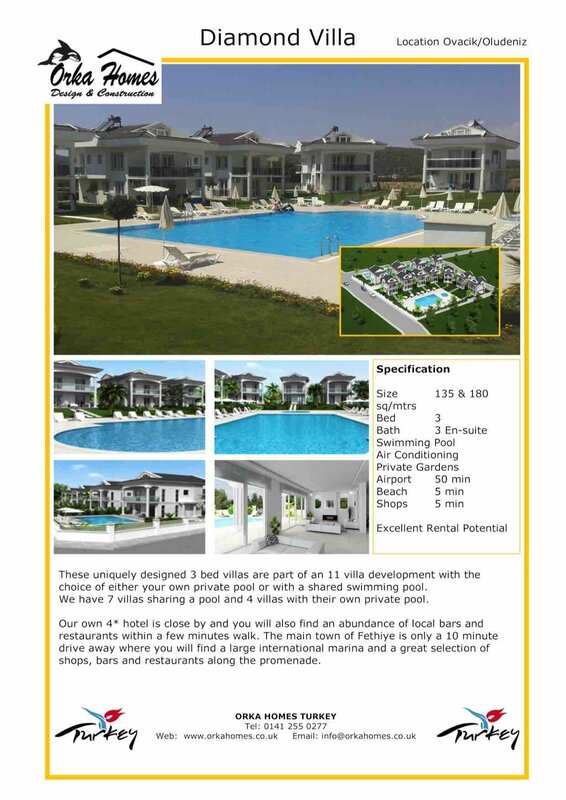 Only 7 of these villas share the pool so there is ample sunbathing room, garden and terraces for everyone to have private space.. Only a few minutes walk from the Orka hotel these villas are ideal for the investment buyer or the holiday home owner if you are looking for rental income. These villas are within a short walk to all the local shops, bars and restaurants and only a short bus ride to the Oludeniz beach and Fethiye Town centre. They are situated just behind the Club Orka Hotel where you will have full use of all the facilities for Free.